TourEgypt is an internet site owned by the Association of Egyptian Travel Businesses on the Internet (AETBI) and is one of the best internet sights on ancient Egypt. 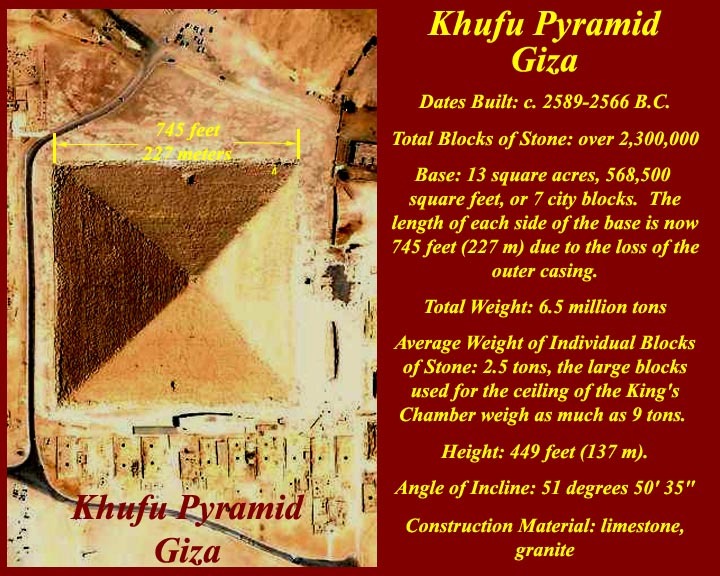 It has more information on pyramids than anyone ever wanted to know. 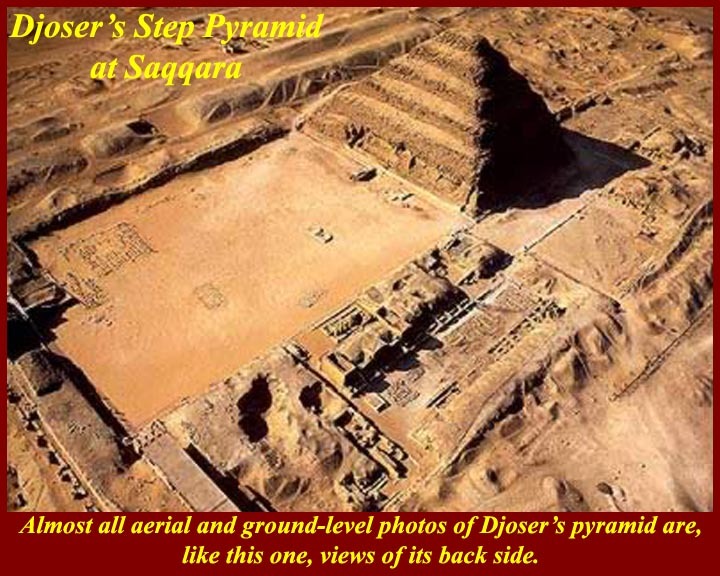 See http://www.touregypt.net/featurestories/pyramids.htm. Use the links on the left side of the page. 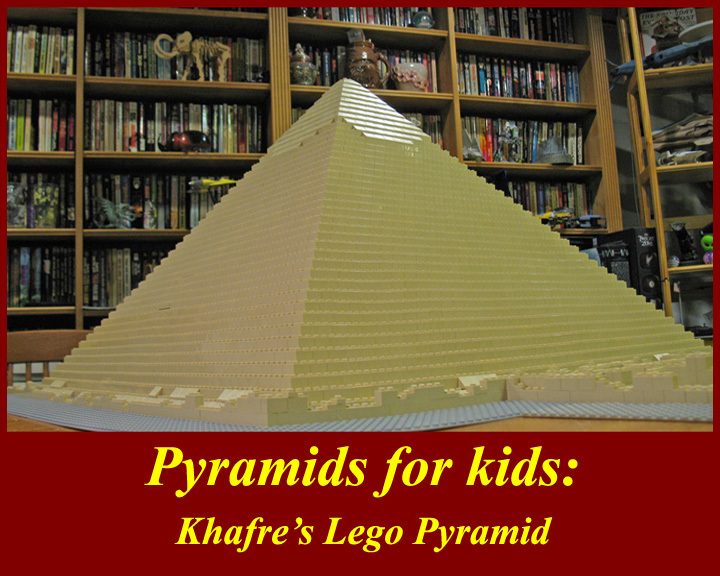 The Khafre pyramid, center, looks taller because it's on higher ground than that of his father, Khufu, left. 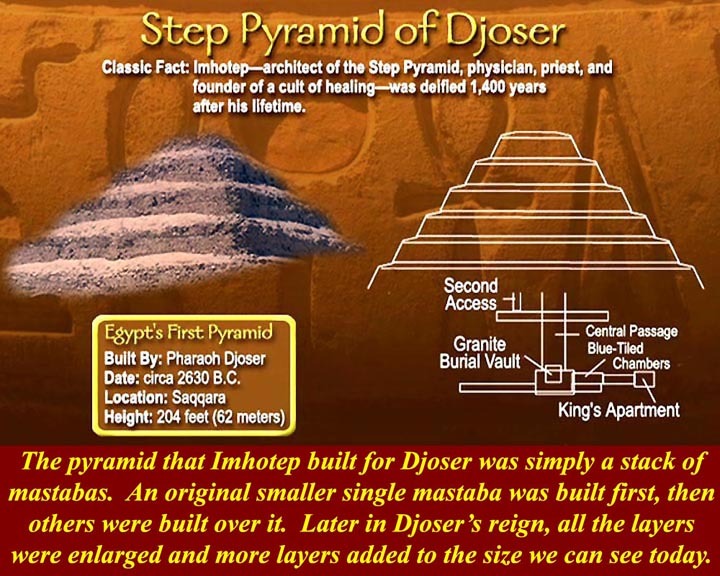 As far as we know, Pharaoh Djoser of the 3rd Dynasty and his master architect, Imhotep, started the long running pyramid fad around 2630 BC..
All of the big pyramid Egyptian areas are on the west side of the Nile near the beginning of the delta. 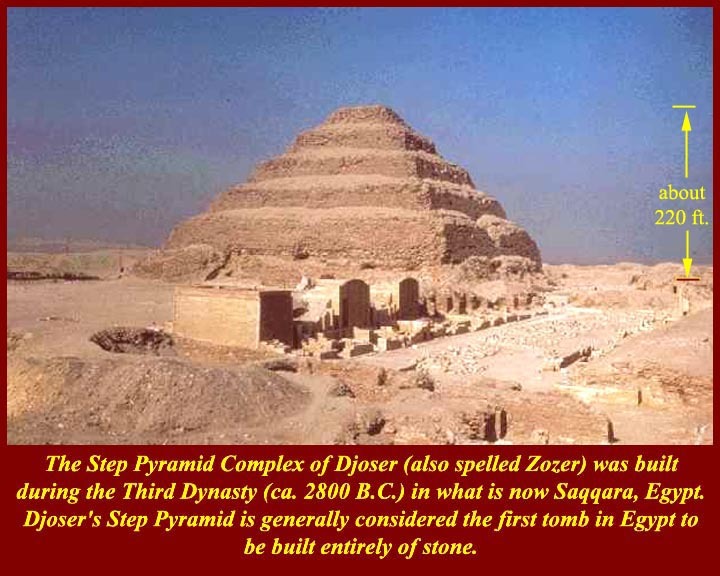 Djoser's pyramid compound at Saqqara was multi-purpose. 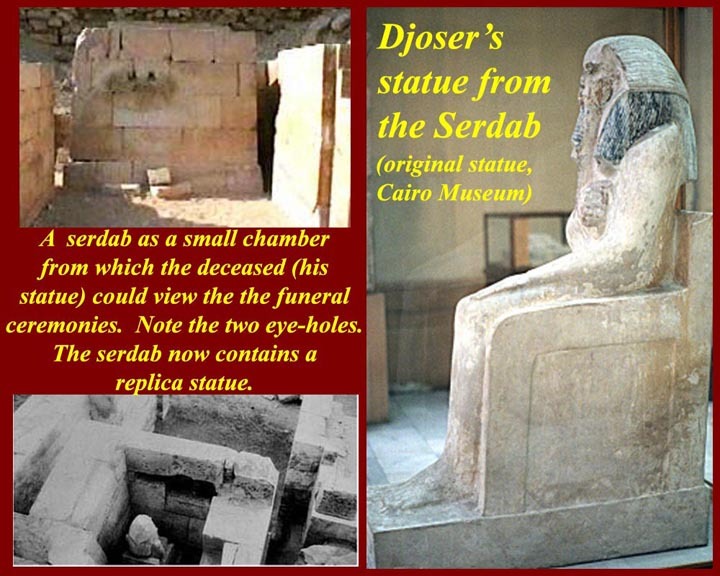 It was the site of his Heb Sed festival as well as his tomb. 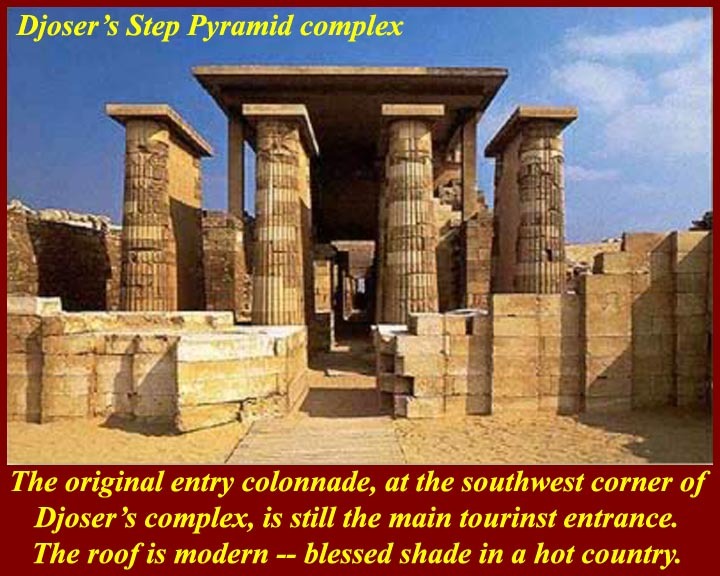 Parts of Djoser's complex have been re-erected, and the main gate has been given a new roof to protect the pillars but also to make the area more hospitable to tourists. 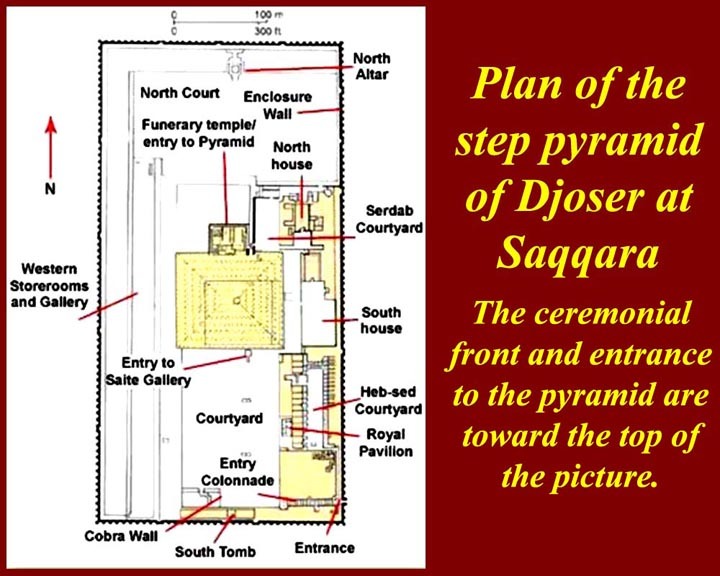 The pyramid itself was built in at least three phases, and the serdab, which would have been inside a traditional mastaba to see ceremonies in the room at the top of the tomb shaft, was moved outside the main structure to see ceremonies at an outside altar. 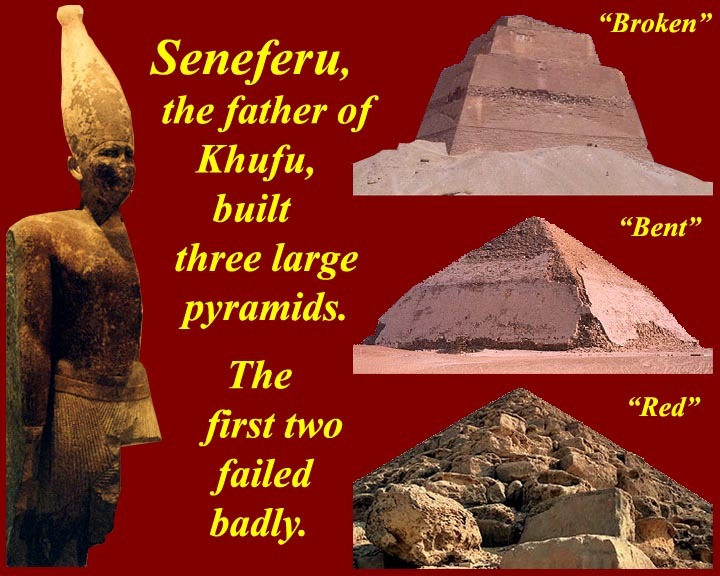 Seneferu, the first pharaoh of the 4th Dynasty, had to try three times before he got a pyramid that was neither broken or bent. 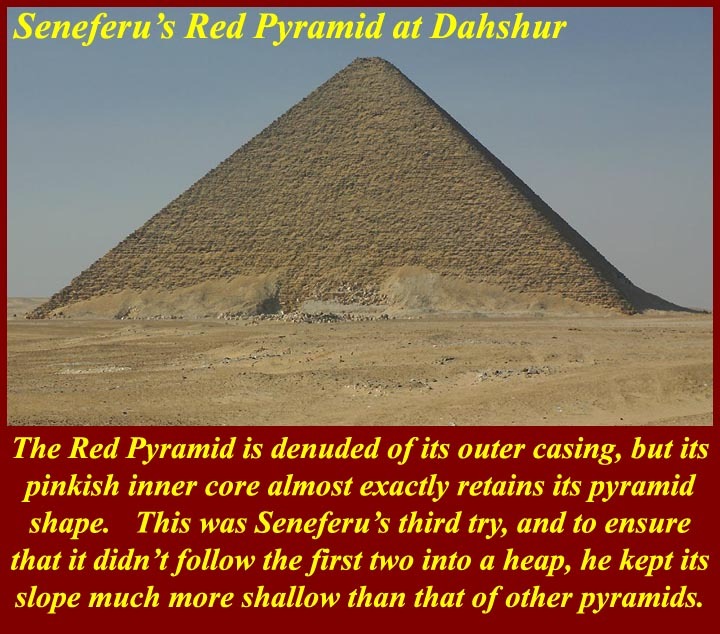 His third pyramid, which finally satified him, was later denuded of its outer casing showing its pink limestone core. 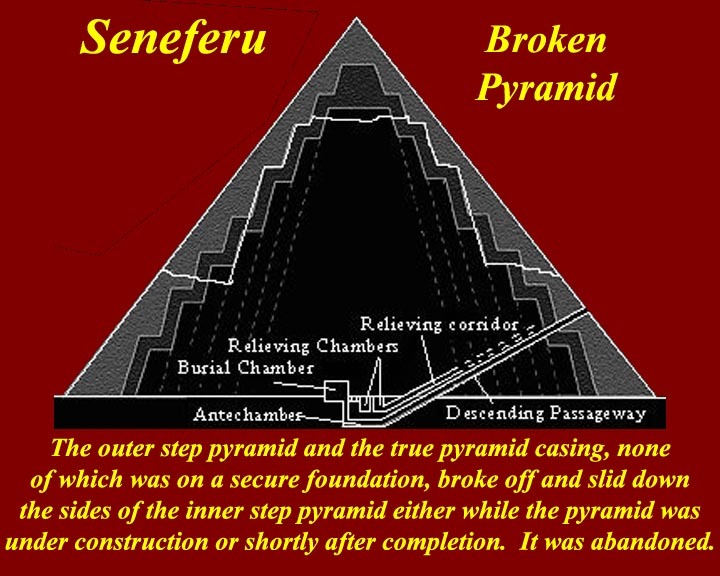 Seneferu's first pyramid at Maidum was what is now known as the broken pyramid. 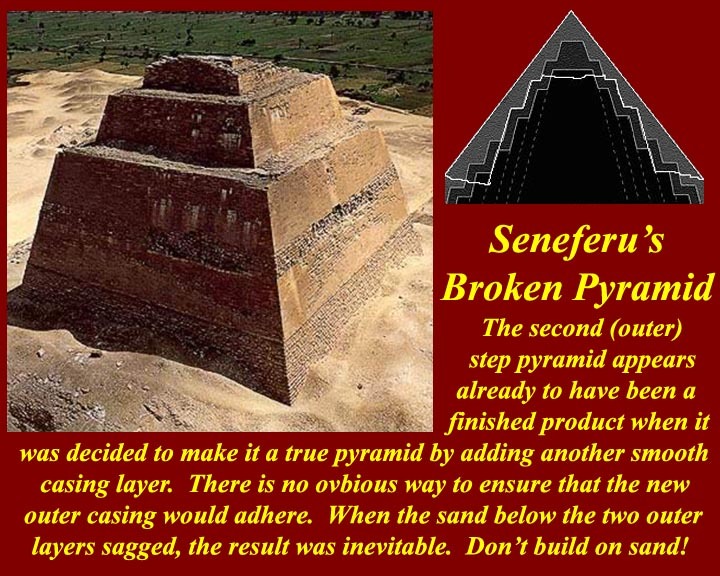 Its main problem -- the reason that it broke -- was that either he or his architect tried to expand a perfectly good step pyramid without expanding its foundation. It fell shortly before or shortly after the expansion was completed. 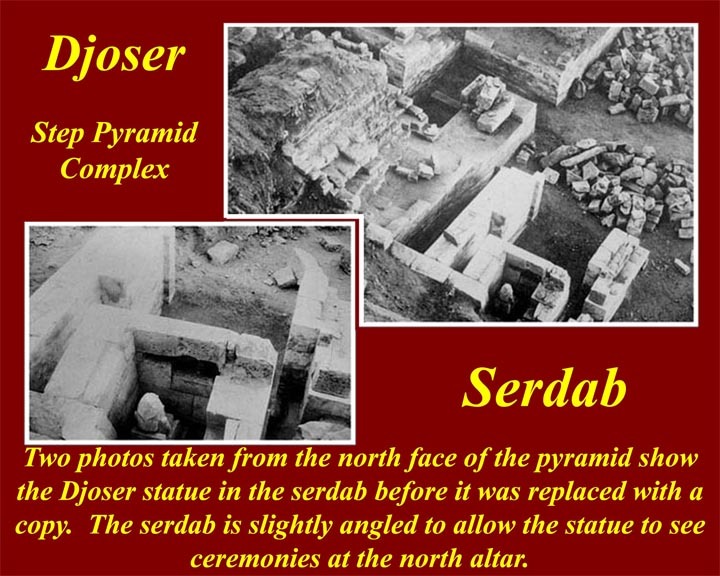 The images show what fell and what stayed in place when their was subsidence in the sand, on which the outer step pyramid stood. Seneferu tried a second time at Dahshur. They began at a steep angle, but the underlying stone wasn't strong enough th support what had been built and it began to collapse. 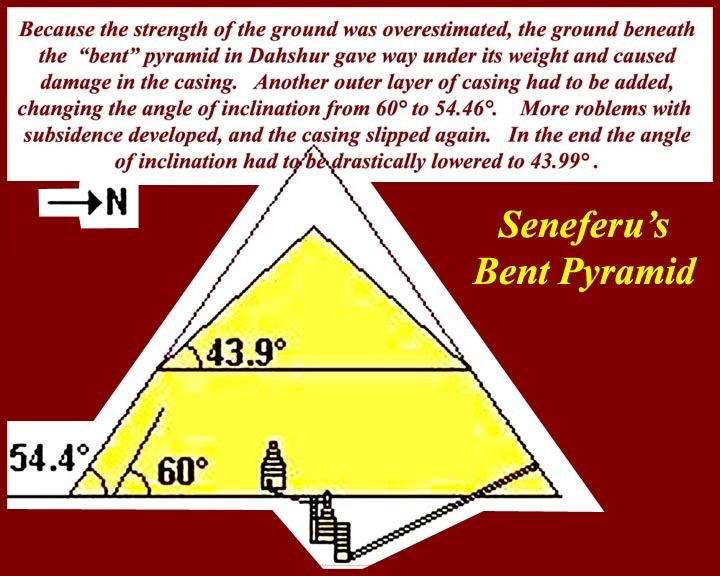 They expanded the base and decreased the slope angle, but halfway up it became obvious that the pyramid would fall if they continued. 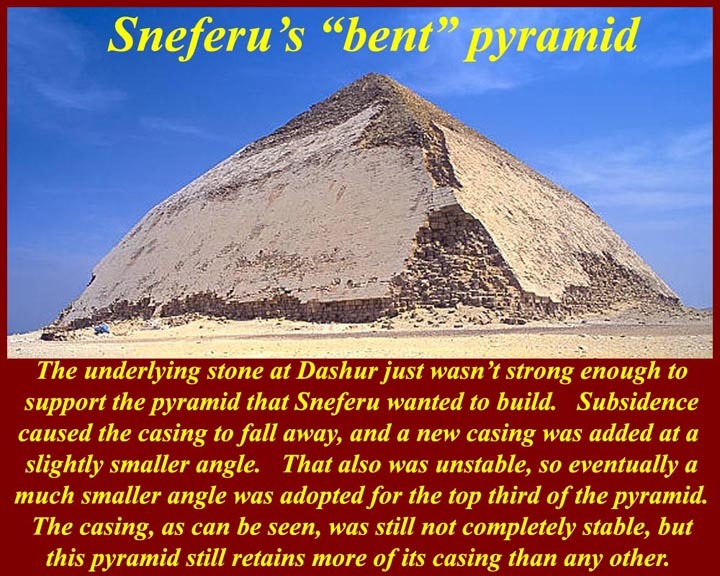 Another drastic decrease in slope allowed the builders to complete the structure with less weight, but it produced the squashed pyramid now called the "Bent" pyramid. 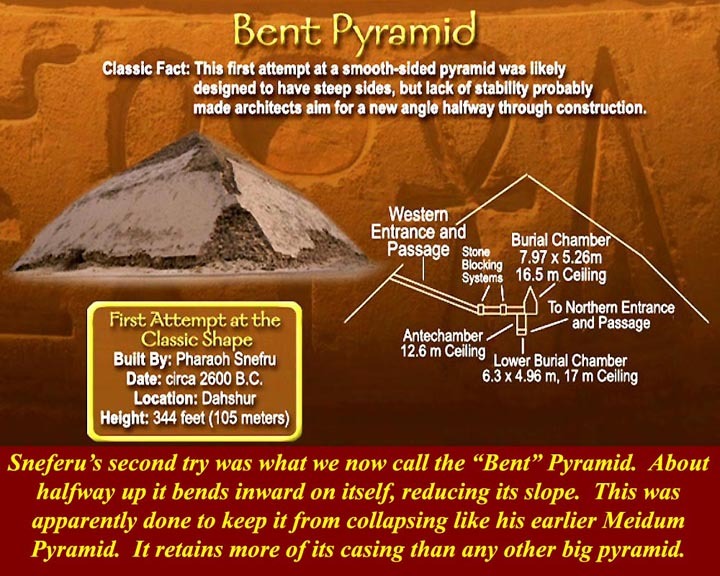 The Bent Pyramid retains more of its outer casing than any other large pyramid in Egypt. Apparently nobody wanted the casing stone. The second image shows the decreased slopes that produced the defective structure. 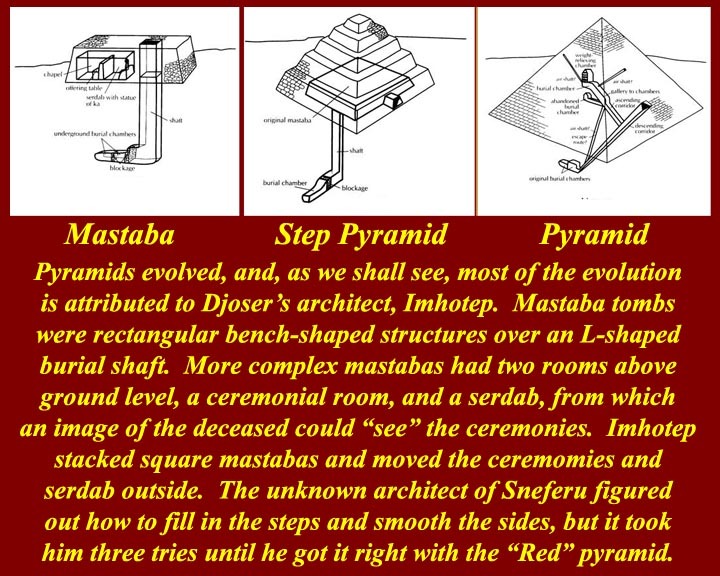 It should be remembered that all of this was experimental: no one had ever built a true pyramid before this. 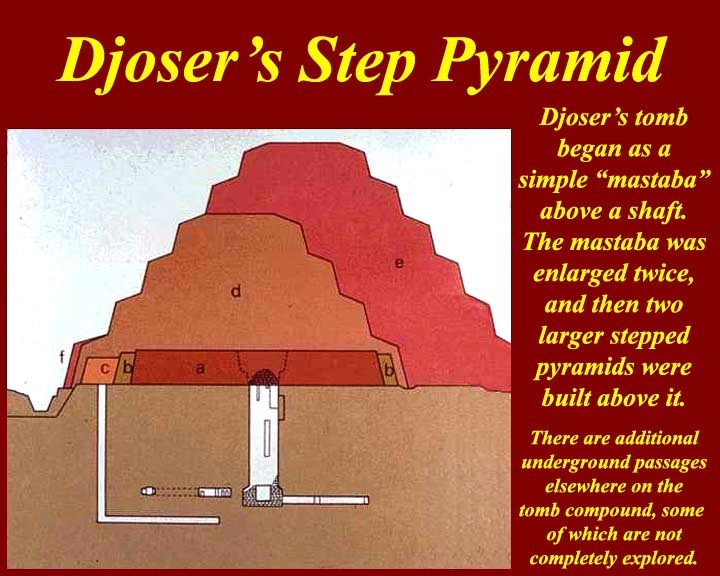 It's not known whether a there is a step pyramid inside trying to get out. pyramid. It has a shallow slope, but it proved the concept. 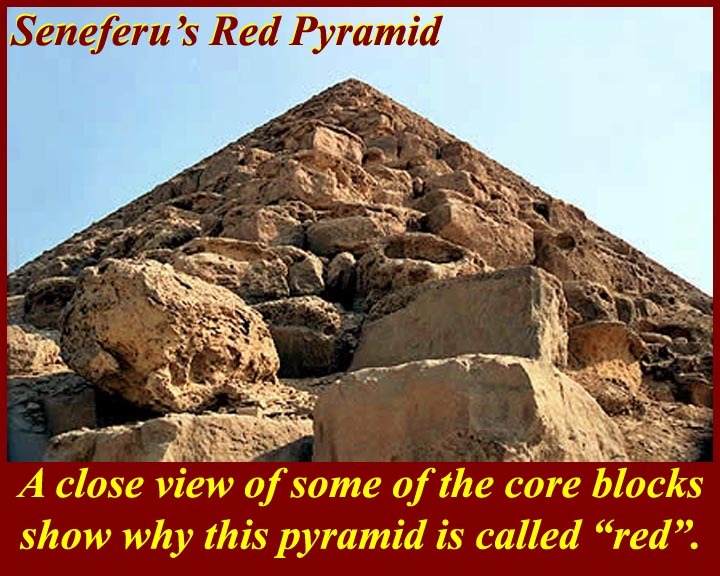 Some pictures of the Red Pyramid that are taken from a low angle emphasize the shallowness of its slope. 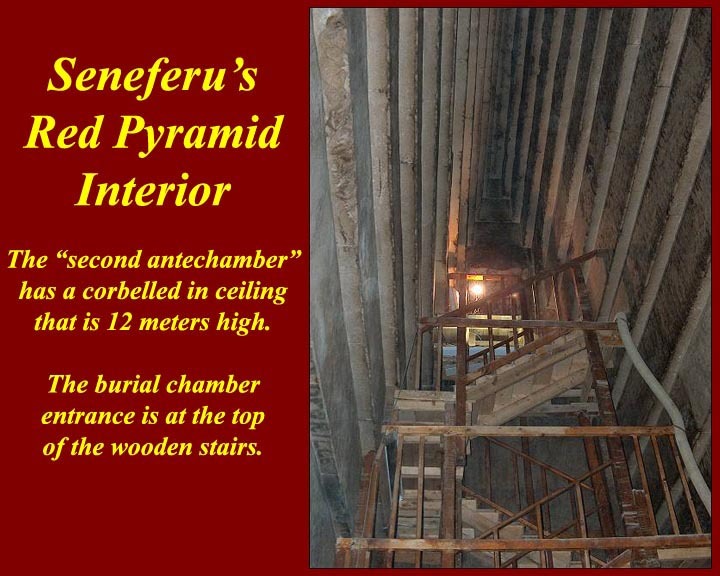 The inside features a huge corbelled antechamber, at the top of which is the entrance to the burial chamber. 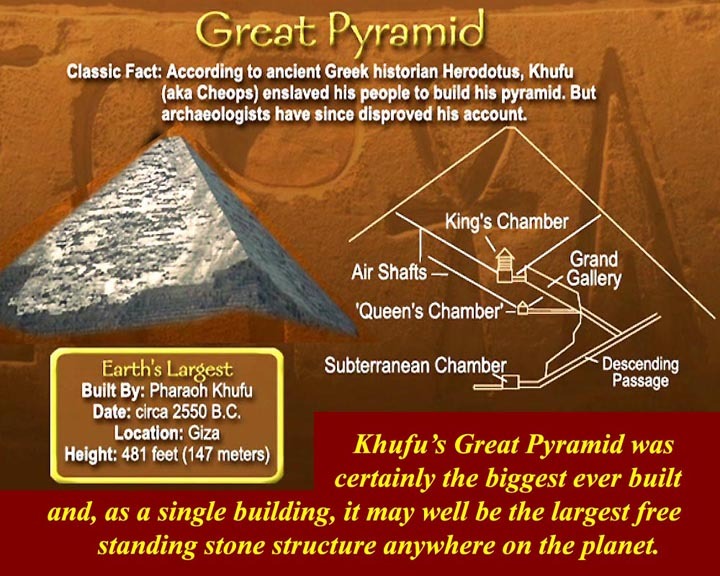 Khufu, the son of Seneferu got it all right the first time with his Great Pyramid at Giza. It was the highest free standing stone structure in the world untill some of the Gothic cathedrals of Europe were built, and it's still the most massive free standing stone structure. 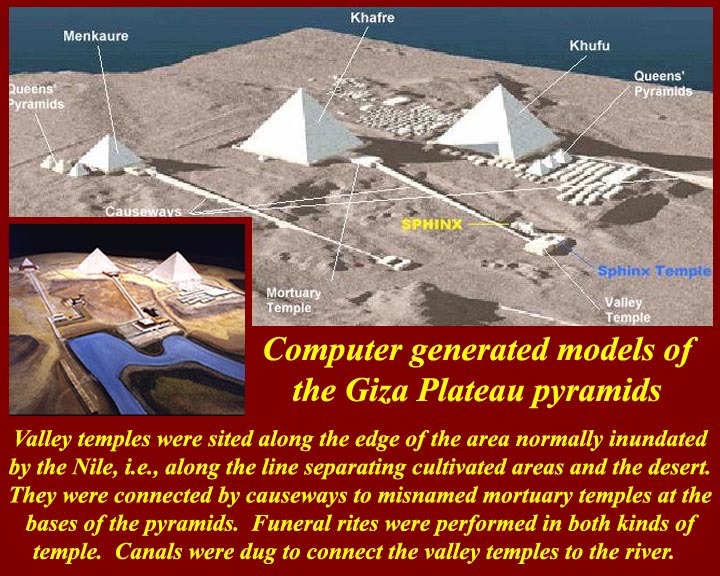 Several pyramid complexes included pits in which boats were entombed. 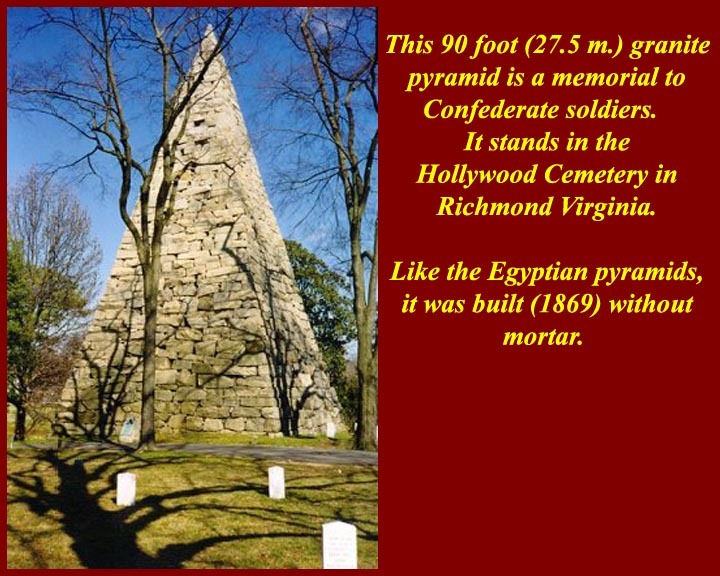 There are various theories about why they were buried, but none of them have been proven. 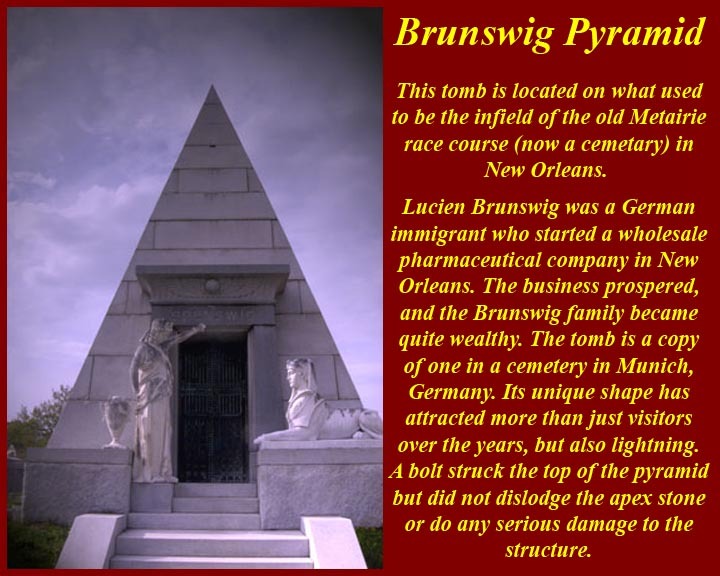 Among the theories: that they were actualy used to transport bodies to their tombs, or that they were intended for post burial mystic voyages in the afterlife, either to the pole star or as part of the daily voyage through light and darkness. 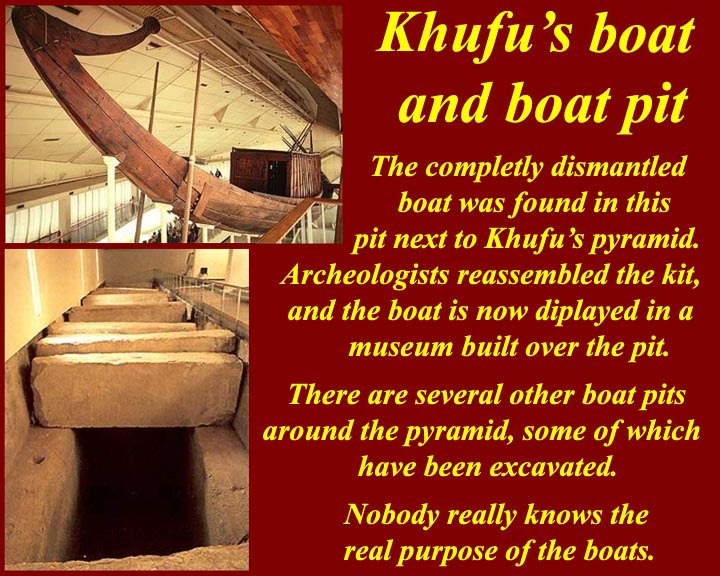 Regardless of their use or intended use, one of Khufu's boats was found completely disassembled and in remarkably good condition. 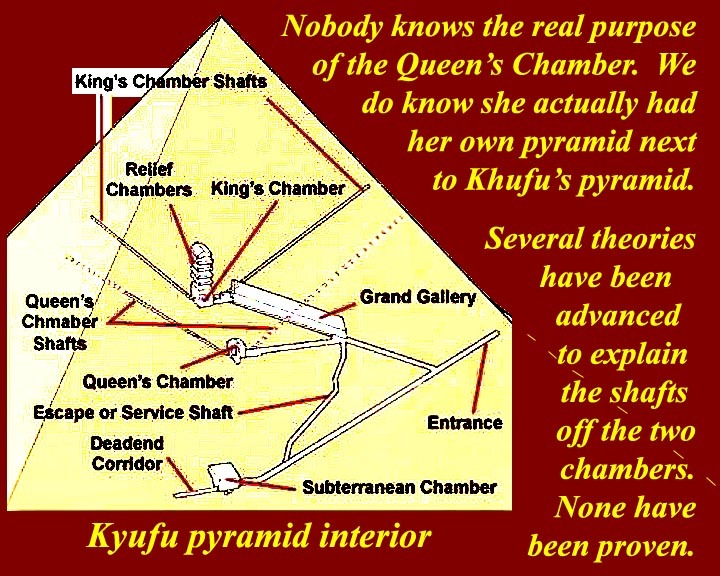 It has been put back together -- all joints are held with rope -- and is now in a special museum south of Khufu's pyramid. The boat will be moved to the new GEM (Great Egyptian Museum) when it is opened in a few years at the northern end of the Giza Plateau. Another of Khufu's boats was discovered at the same time as this one, but it has, unfortunately, been badly damaged by insects that got into the pit where it was stored: the discoverers inadvertently broke the seal on the pit and gave the bugs a way in. 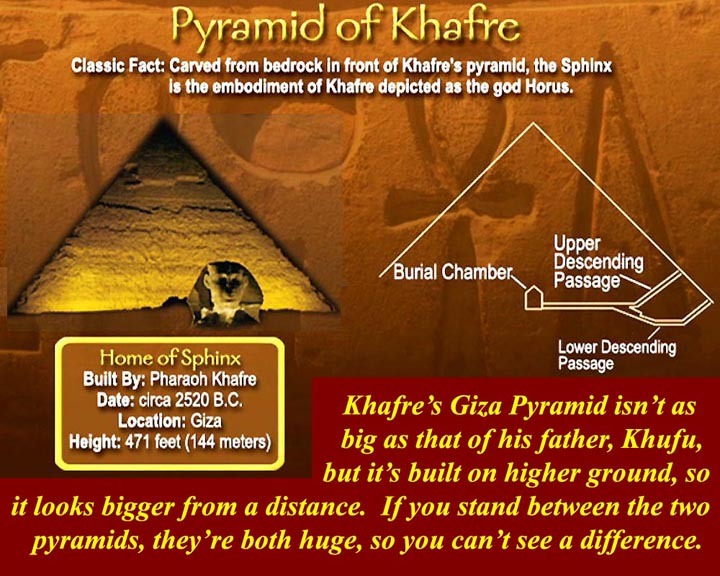 Kyafre's pyramid is smaller than that of his father, Khufu, but it looks bigger because it's built on higher ground. 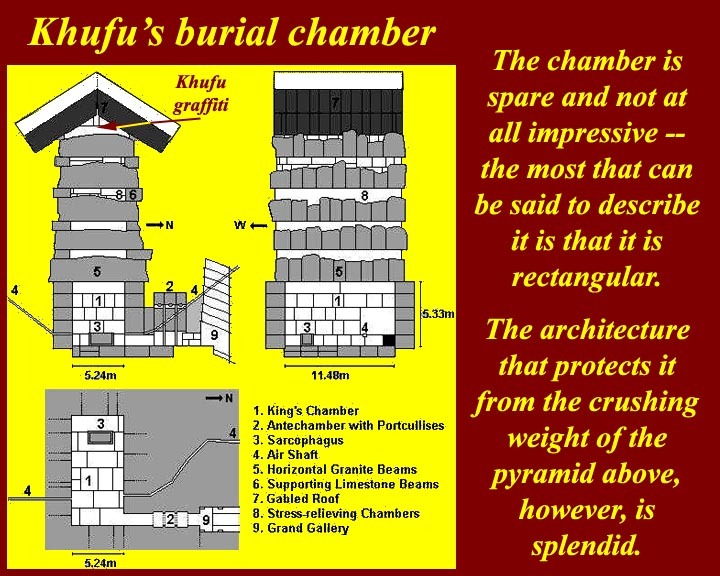 There is no explanation for why Khufu built his pyramid on a lower terrace of the Giza Plateau, but one could speculate that it would be easier to move stone to the lower level. 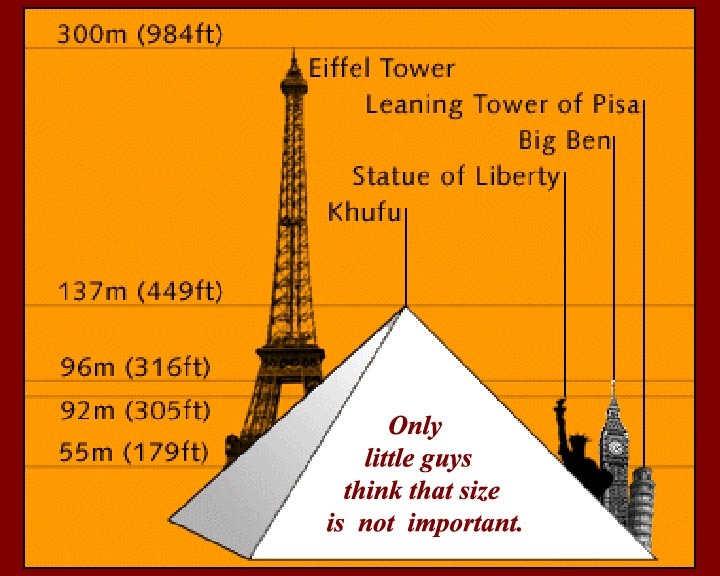 To review the illusion of greater height, return to http://www.mmdtkw.org/EGtkw0601aaGizaPlateau.jpg which was the first image in this presentation. 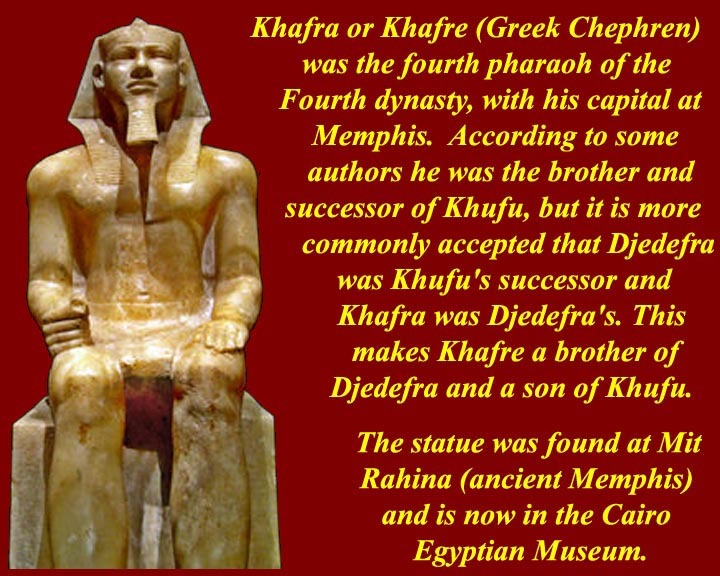 Although the ancient "kings lists" caused some confusion, it's now generally held that Khafre was the brother of his pharoanic predecessor Djedefra and that both brothers were sons of Khufu. 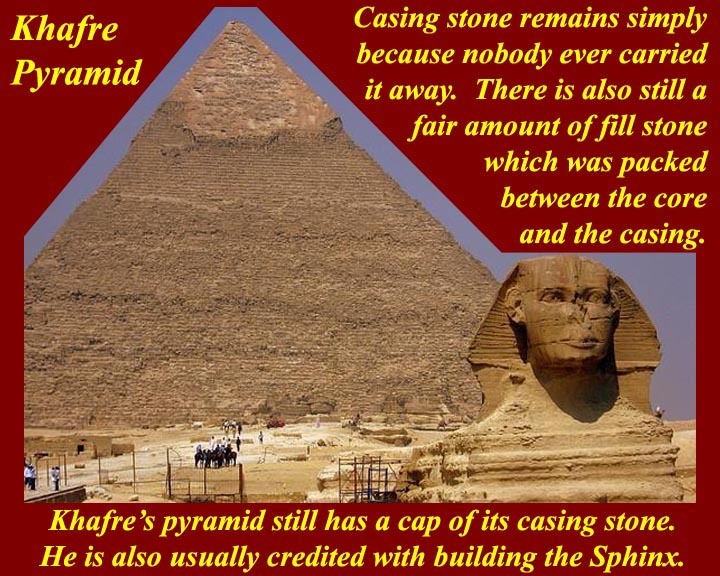 Khafre is also now generally held to be the builder of the Great Sphinx which lies to the side of the causeway between his valley temple and his pyramid temple. 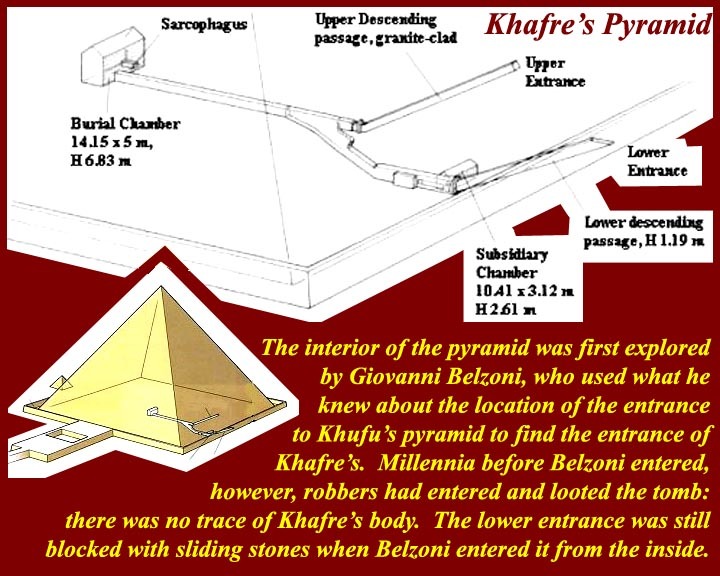 When Giovanni Belzoni forced entry into the Pyramid of Khafre in Giza in 1818, he dispelled the view that it was just a solid pile of masonry. 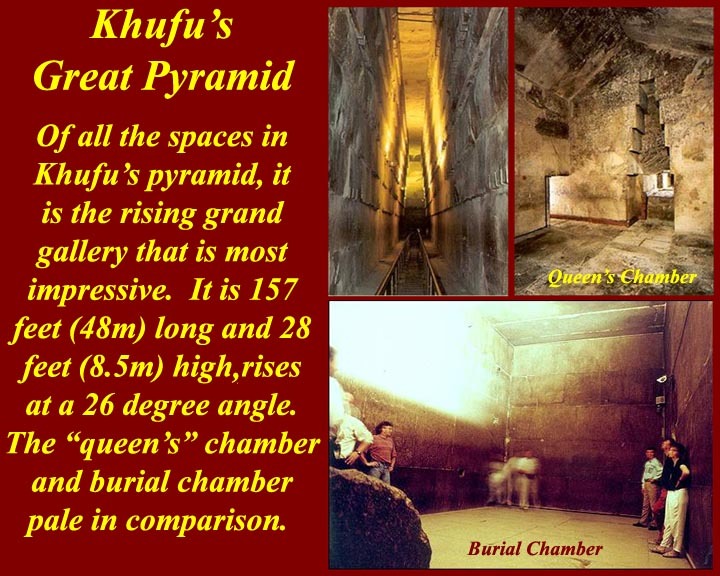 He reasoned that if there was an entrance to Khafre's tomb it should be in the same relative location as the one into Khufu's. 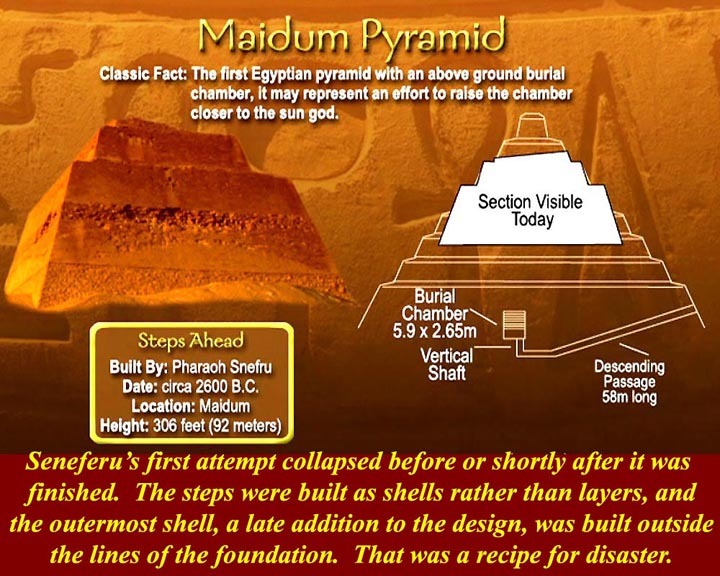 After digging through some rubble at the base of the Kyafre's pyramid, he found its entrance just where he had predicted it would be. He had to break through some ancint security precautions, but did so with relative ease. 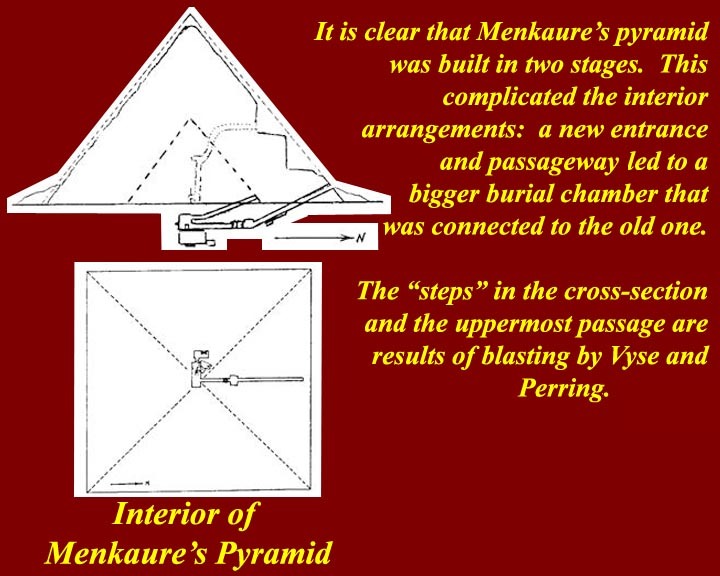 Once inside Belzoni found all of the passages and rooms that are visible today, including a lower passageway that leads out of the pyramid complex -- although he was not able to explore that passage to its outer end due to large blocks of stone that had been slid down its descending ramp. 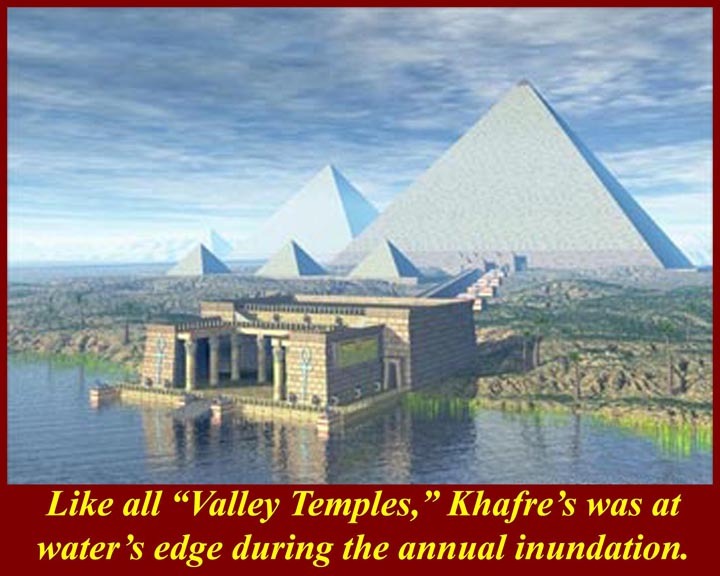 The last image shows an artists rendering of the pyramid with its water-side valley temple. The water is a canal that connects to the Nile River. 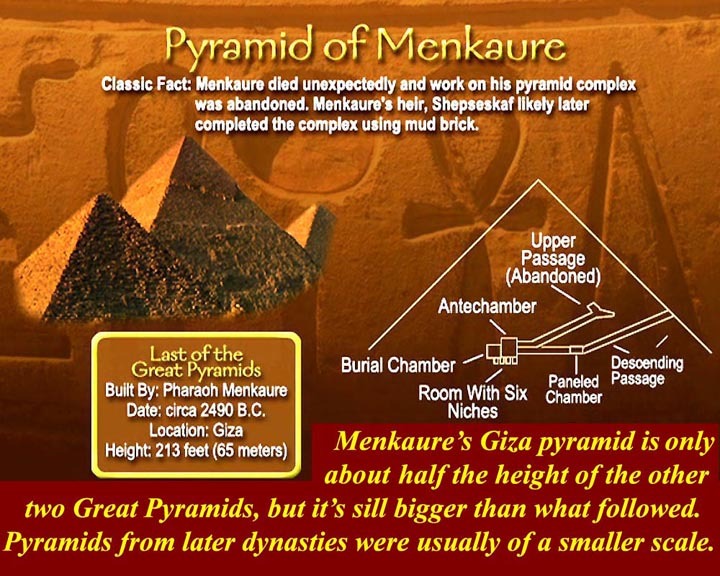 Menkaure's pyramid at Giza is considerably smaller than those of his father Khafre and his grandfather Khufu. But the interior rooms and passages are much more complex than those in either of its two predecessors. 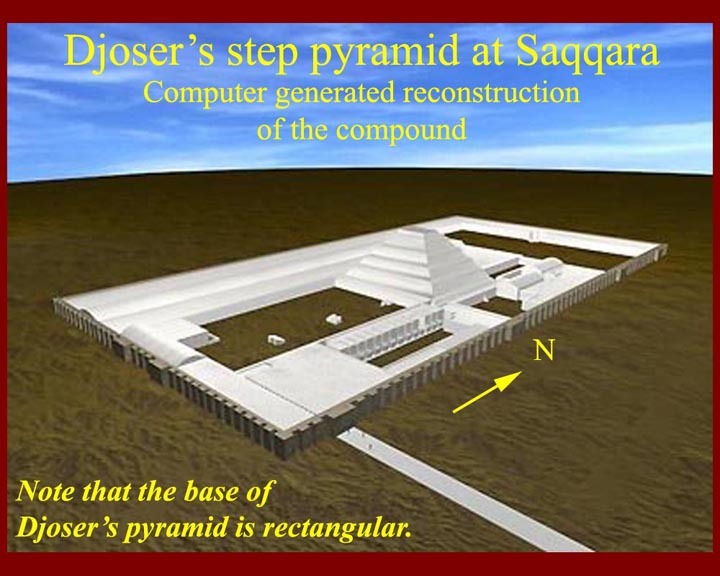 This is apparently because a smaller pyramid with all of its interior structures is hidden inside the present pyramid. 19th century archeologists Vyse and Perring used high explosives to blast their way into this pyramid (and other Egyptian sites). Although this may seem extreme in our day of careful and meticulous digging, they did no real damage to anything of archeological interest, and their methods did lead to some interesting discoveries. 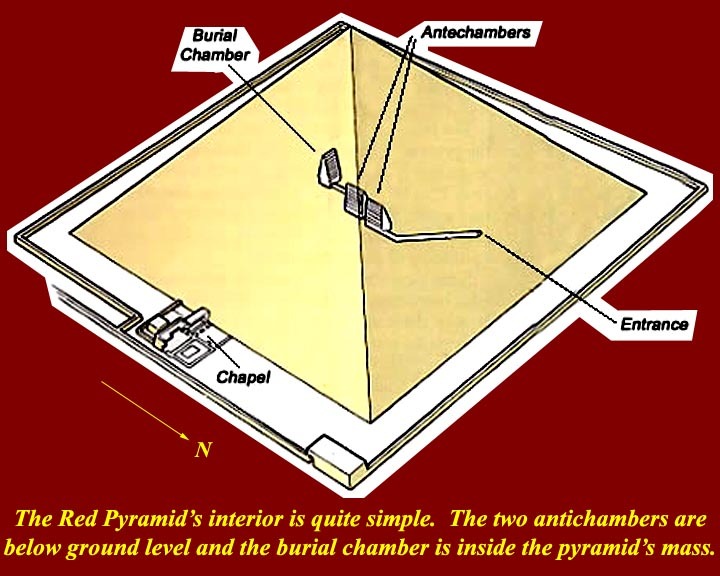 Once the pyramid was penetrated, the builders' passages were cleared and the pyramid's complex interior structure was revealed. 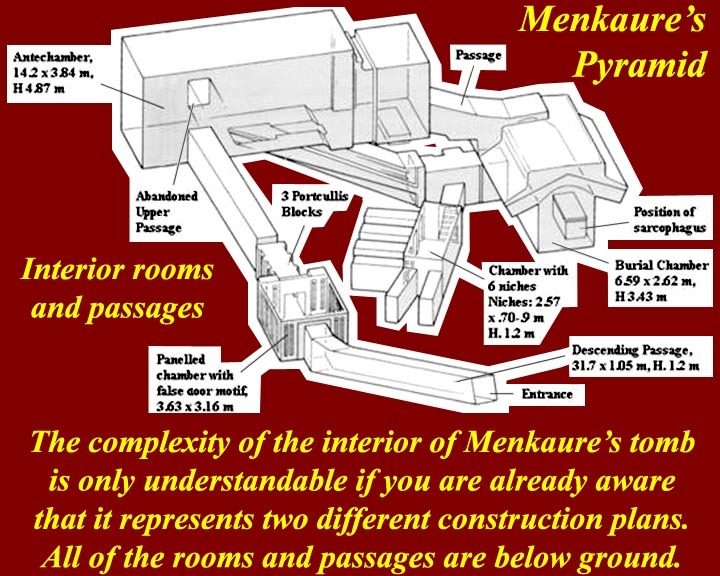 Menkaure's sarcophagus was found in the burial chamber, but there was no trace of the body. 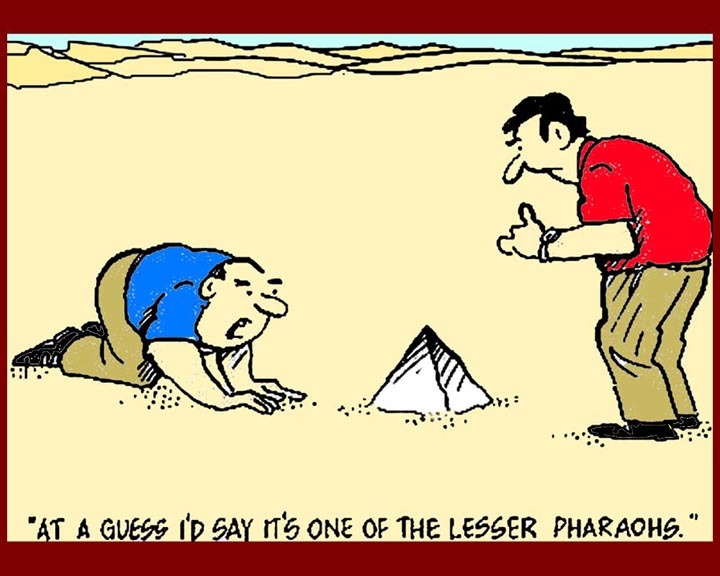 Once again, ancient tomb robbers had gotten in long before the modern ones arrived. 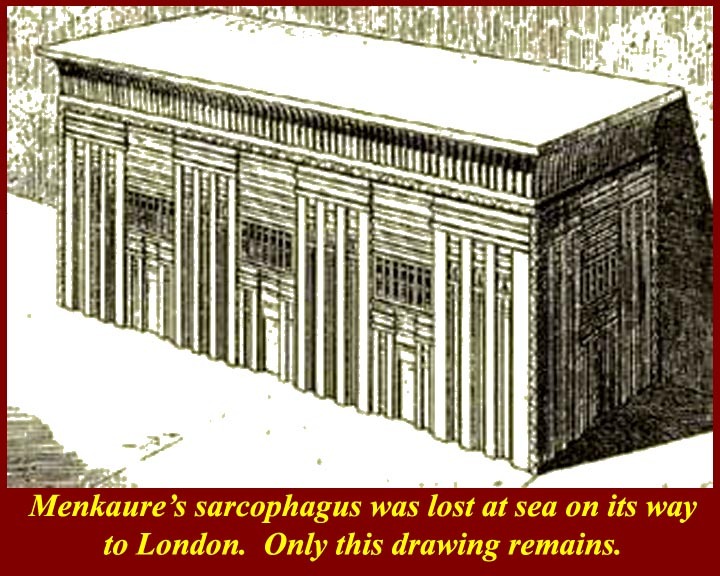 The sarcophagus was put aboard a ship for Emgland, but both ship and box went to the bottom in a storm. Only drawings remain. 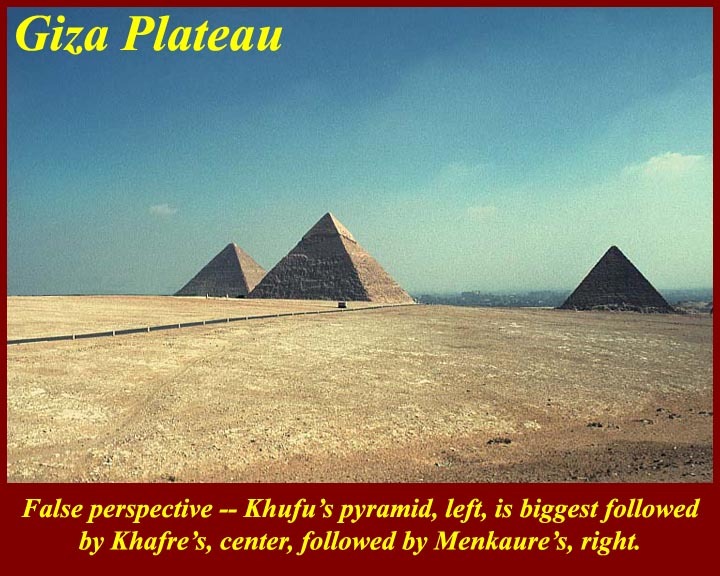 The image shows how the Giza Plateau would have looked when the pyramids and their subsitiary structures were still in their white limestone casings. 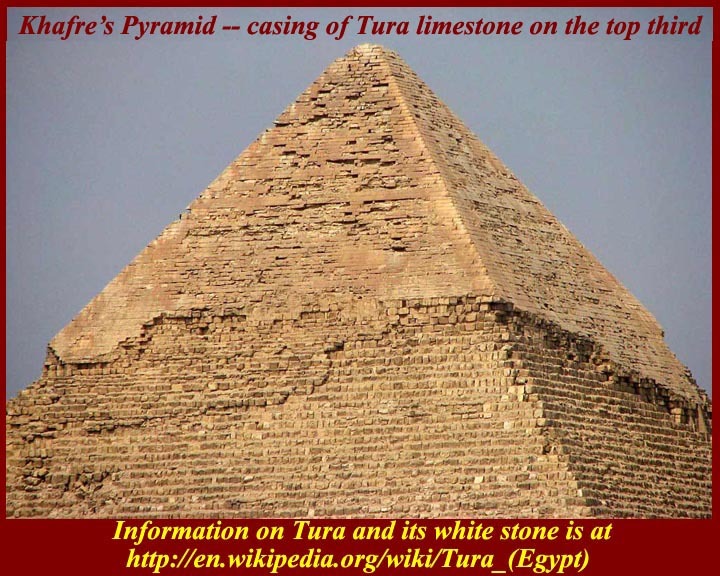 The best white stone came from Tura, but there were many different quarries in historic Egypt. 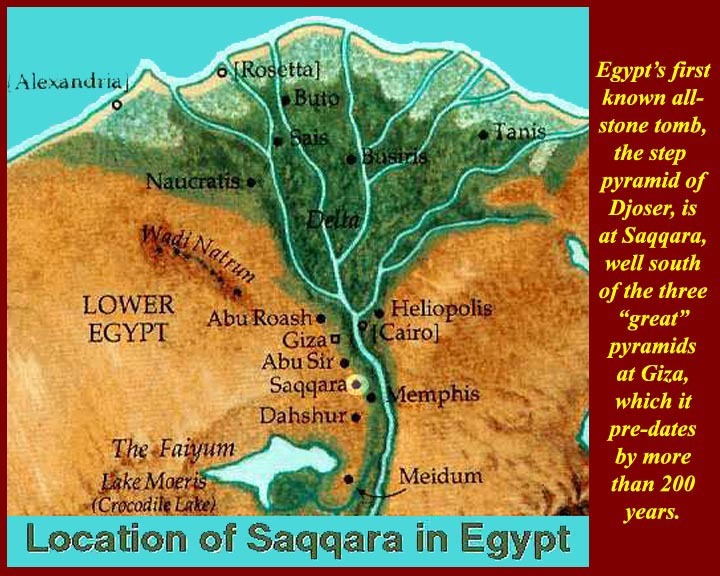 For more information, see http://en.wikipedia.org/wiki/Stone_quarries_of_ancient_Egypt. 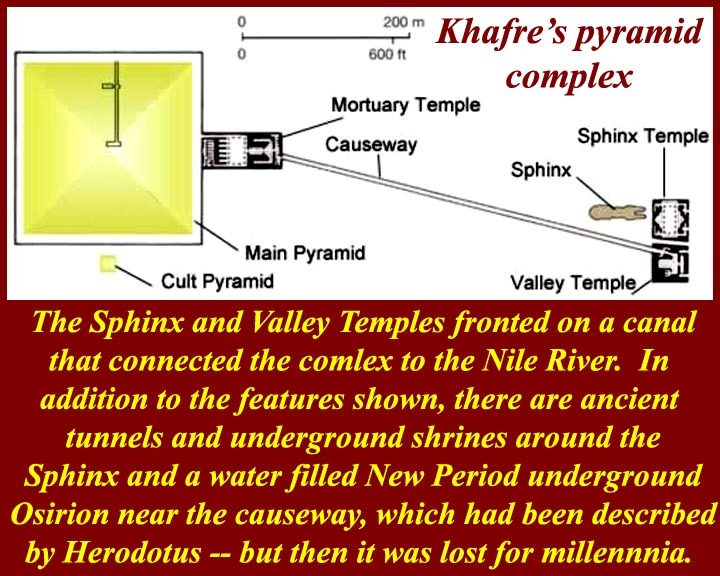 The inset in the image shows the valley temples of Khafre and Menkaure served by the same canal connected with the Nile. 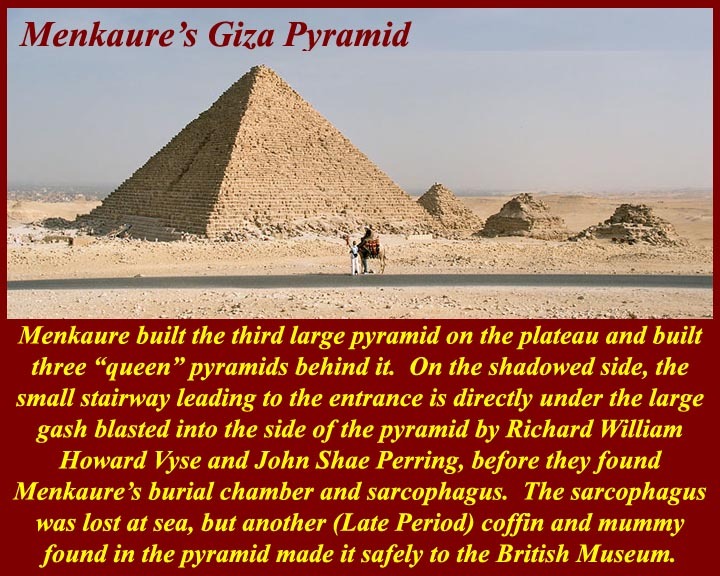 Although pharoanic pyramids continued to be produced up until the end of the second intermediate period, the really big ones died out in the 6th Dynasty of the old Kingdom. 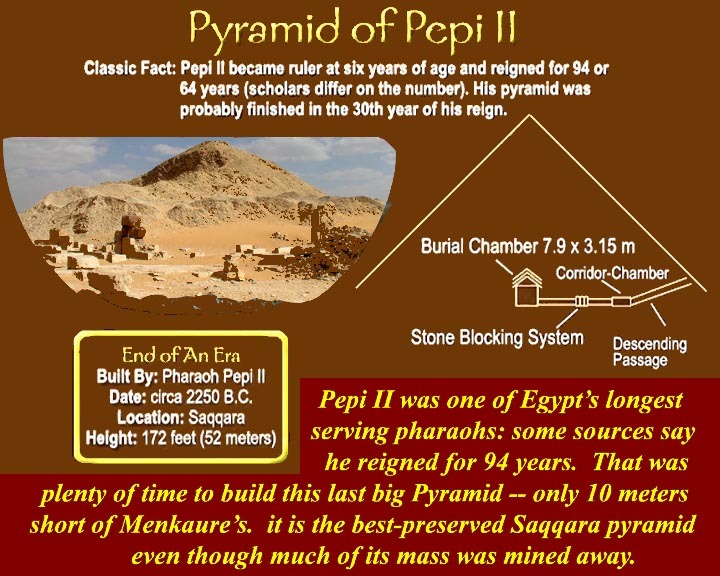 The last Pharaoh of the 5th Dynasty, Unas, produced a pyramid that was about 55 meters tall, and Pepi II of the 6th Dynasty produced the last big pyramid built in the old tradition. 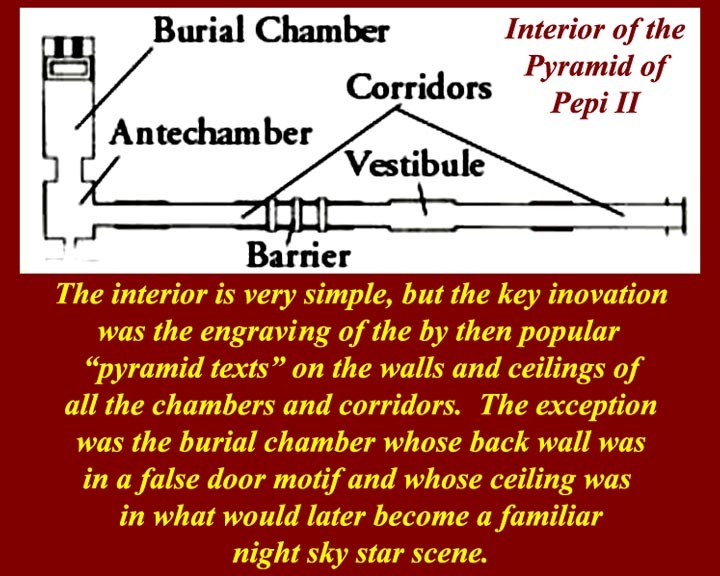 By his time, "pyramid texts" were popular (they later were written on scrolls as "books of the dead"), and all the chambers and passages of Pepi's pyramid were covered with relief carvings of the texts. 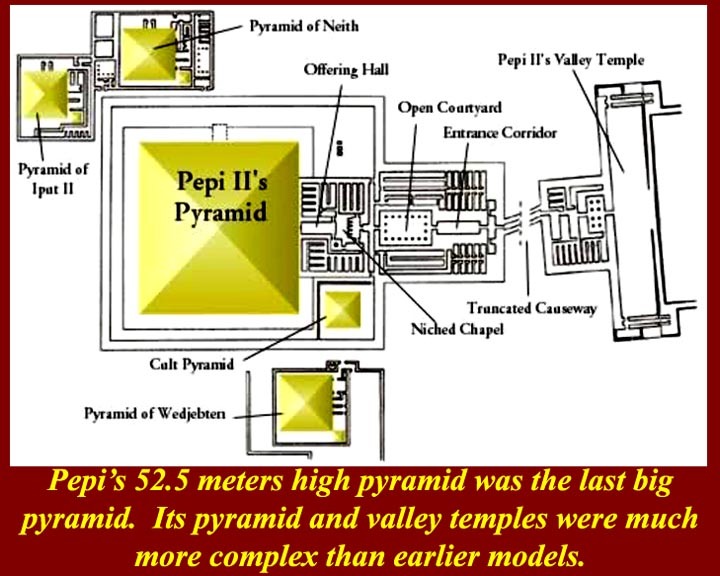 The valley and pyramid temples of Pepi II were of a more complex plan than was usual. 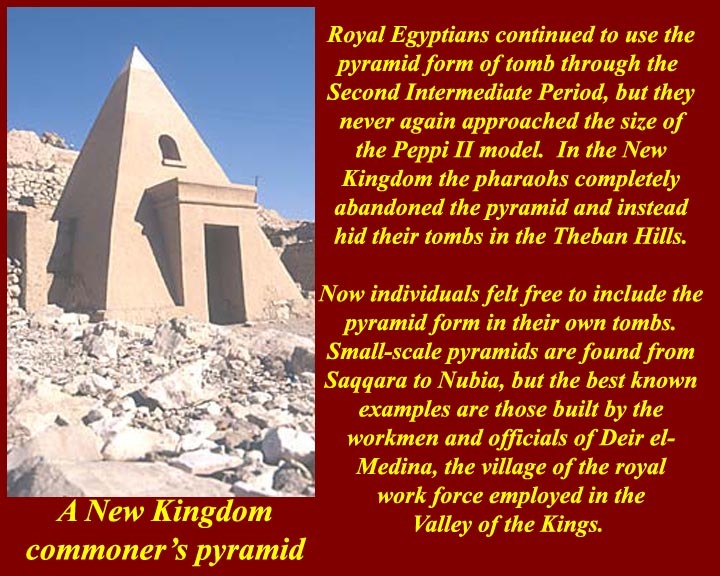 When the New Kingdom pharaohs abandoned the pyramid for for their tombs, that made the form available for commoners. 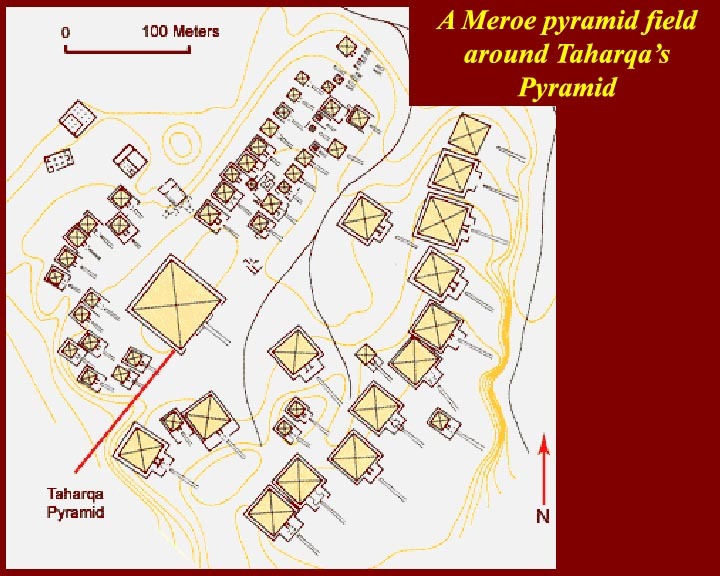 The best examples are in the workers' and bureaucrats' villages in the Theban necropolis. The one in the image has been heavily restored as an exemplar. 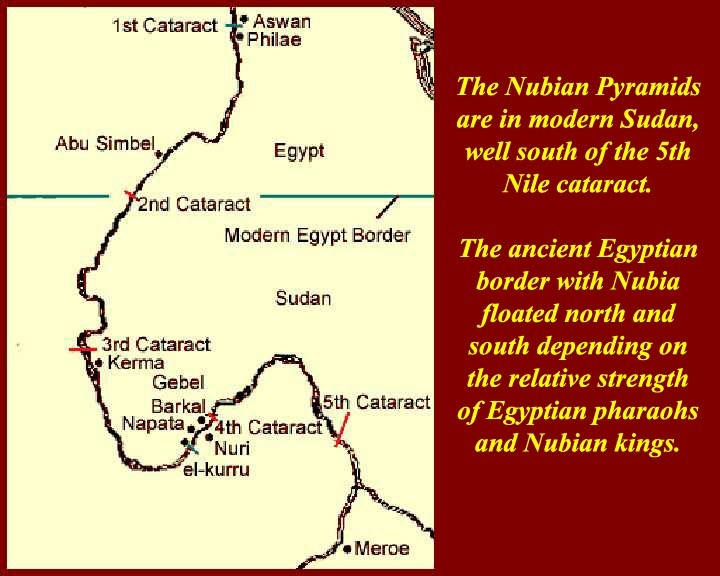 The last Egyptian gasp of the pyramid builders took place away to the south above the 5th Cataract in Nubia. 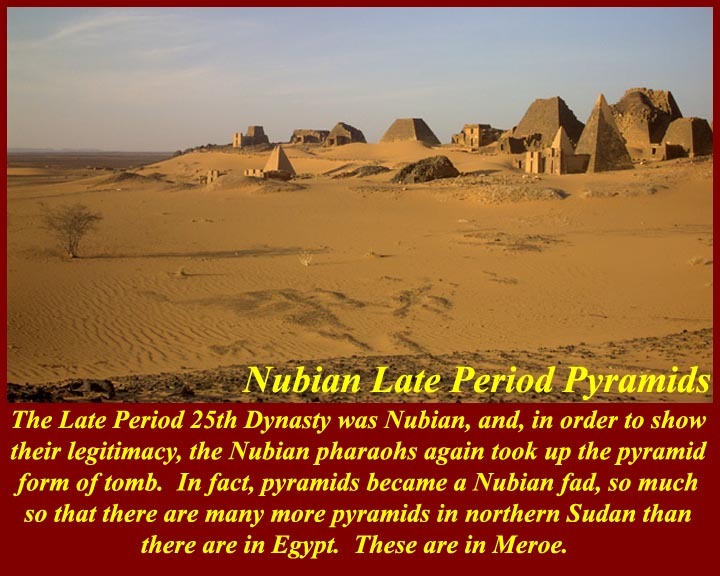 The Nubians took control of Egypt in the 25th Dynasty, and to prove that they were "good Egyptians" and not foreigners they adopted everything Egyptian, including, of course, pyramids. 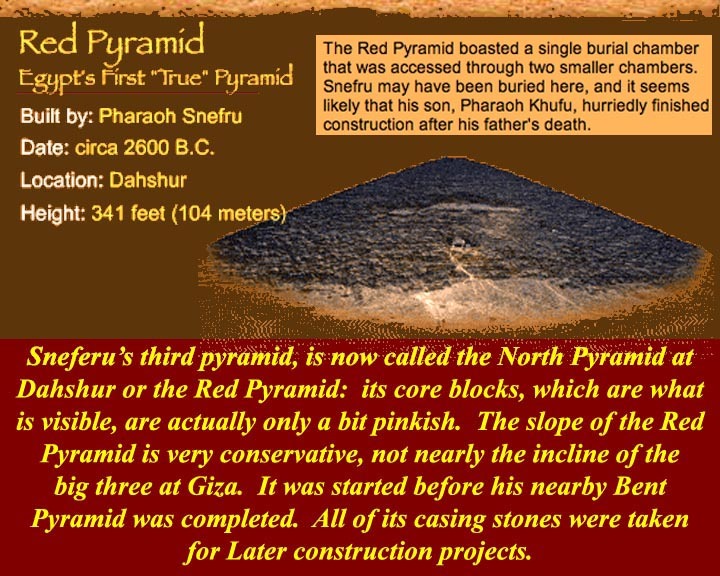 Soon any Nubian who could started to build a pyramnid, and so there are now actually more pyramids in northern Sudan (ancient Nubia) than there are in Egypt. 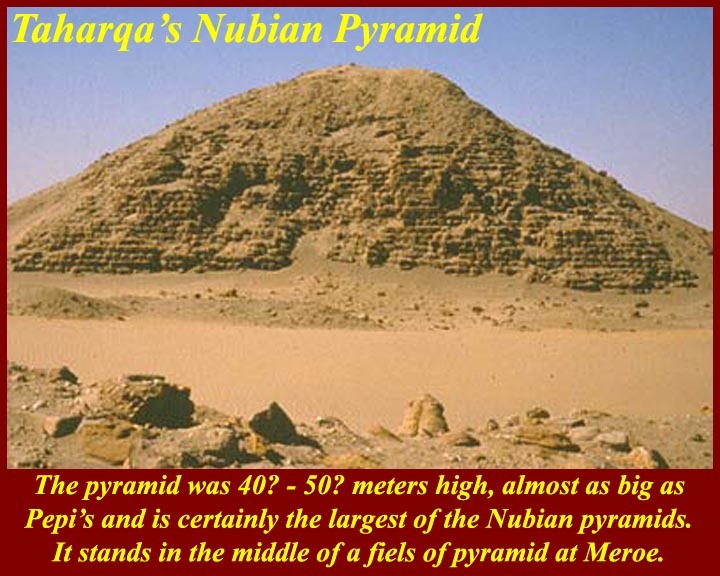 The biggest Nubian pyramid belonged to Taharqa, one of those 25th Dynasty pharaohs, who ruled from 690 to 656 BC. 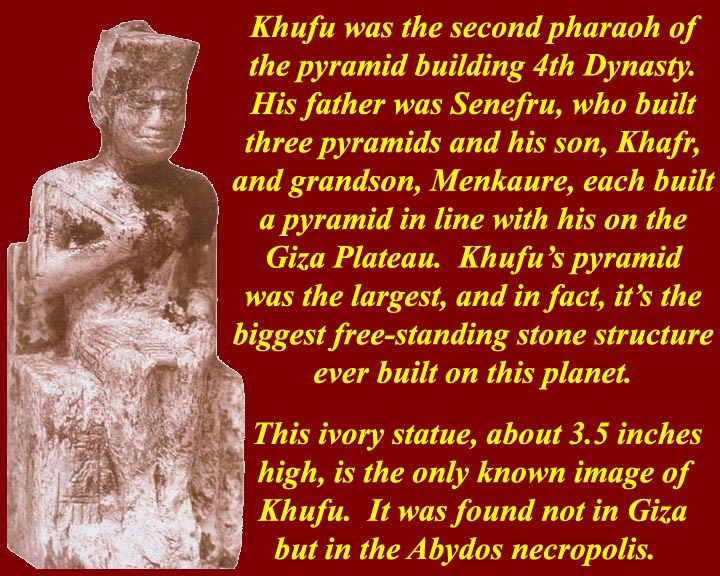 It sits in the midst of one of several Nubian pyramid fields in and around Meroe. 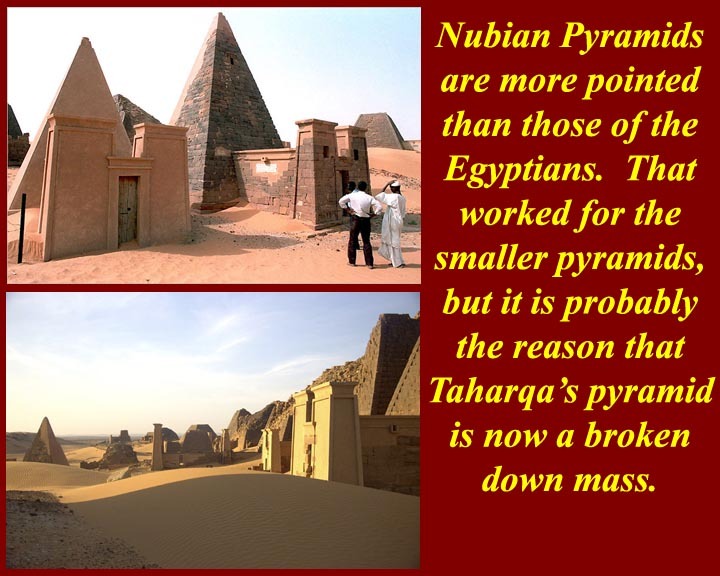 Nubian pyramids had a much steeper slope than those of the earlier Egyptians, and that worked for the smaller ones. 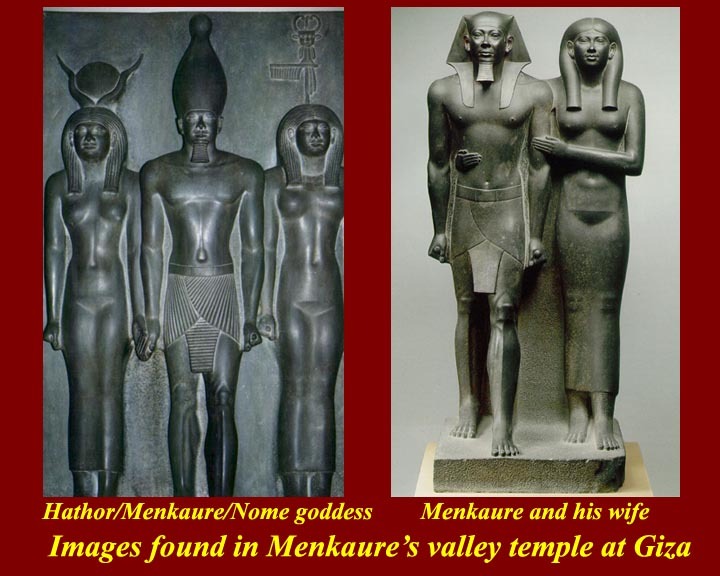 The larger ones, like Taharqa's could not support their own weight, and the results are seen in the second image. 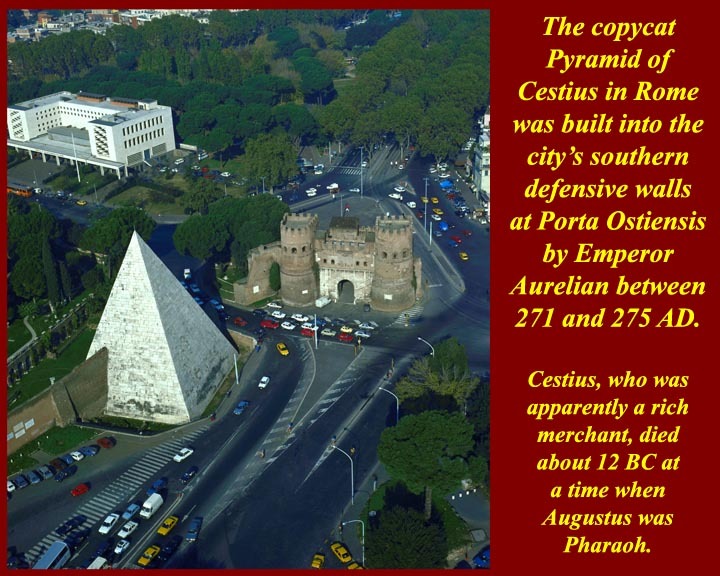 This pyramid was incorporated into the southern side of the Aurelian walls of Rome next to Porta Ostiensis between 271 and 275 AD. 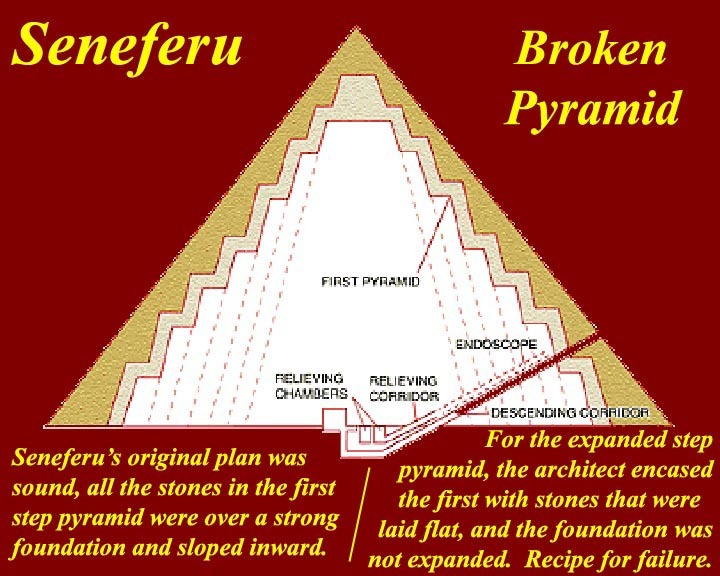 The pyramid itself dates from 14 BC, according to its inscription, and was built as a tomb for Gaius Cestius Epulo, a magistrate and member of one of the four great religious corporations at Rome, the Septemviri epulonum. By this time, Egypt had been conquerred by Rome and, technically, was a personal fief of Augustus, who had been proclaimed Pharaoh after the death of Cleopatra and of her son by Julius Caesar, Ptolemy Caesar. Egyptian themes, which had become unpopular at the time of Antony and Cleopatra, were now again safe to pursue in Rome. 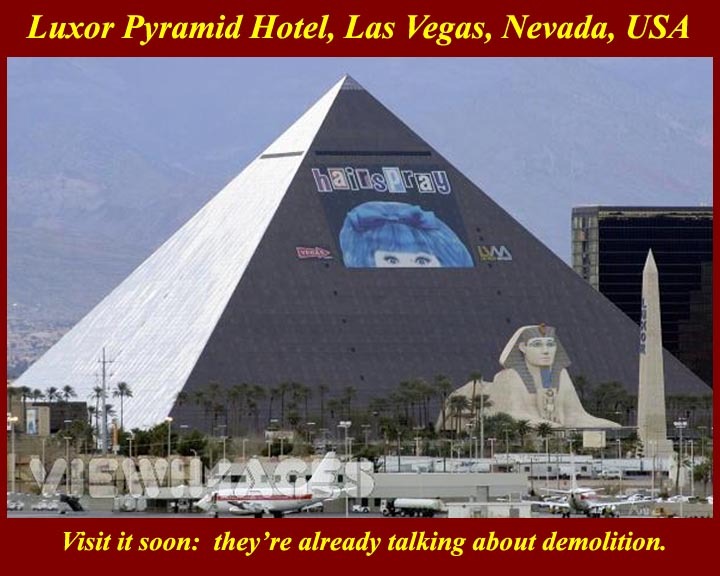 Some more recent pyramids. 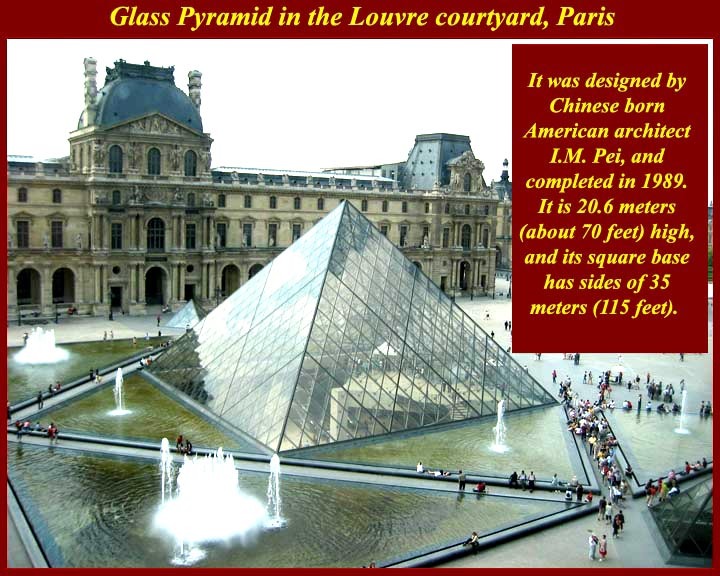 The pyramid shape is still popular, in part because of its historical connections and its assumed permanency. It still appears in architecture and, of course, on every US $1 bill.